Copyright © 2013 Cristhian Carrasco et al. This is an open access article distributed under the Creative Commons Attribution License, which permits unrestricted use, distribution, and reproduction in any medium, provided the original work is properly cited. Paja Brava is a native South American grass with a high carbohydrate content. 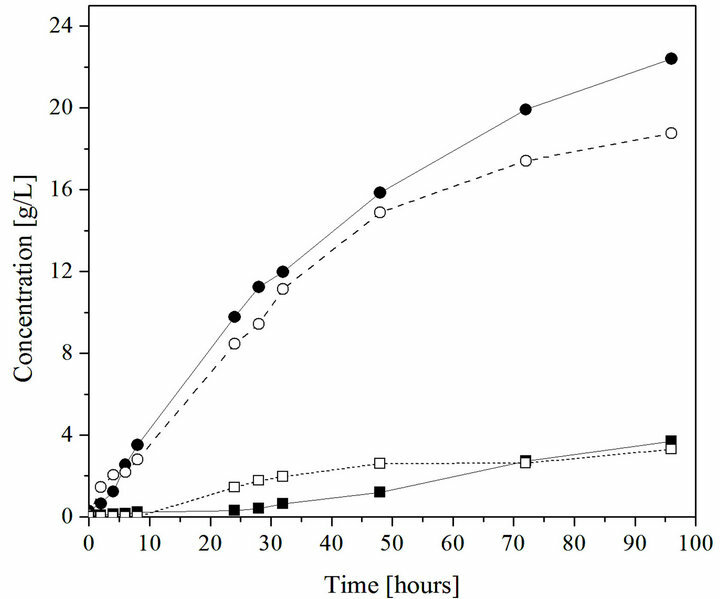 In the current work, the potential of using this feedstock for ethanol production using a simultaneous saccharification and fermentation (SSF) process with the xylose-fermenting yeast Pichia stipitis (Scheffersomyces stipitis) CBS6054 was investigated. The straw material was subjected to SO2 catalyzed steam pretreatment at 200˚C and 5 min residence time, which resulted in a solubilization of pentose sugars (mainly xylose) of 64% with only minor amounts of degradation products. The obtained material, including the pretreatment liquid, was subsequently hydrolyzed and fermented in an SSF process at microaerobic conditions using either a batch or a fed-batch process at a total water-insoluble solids loading of 10%. Overall yields of ethanol based on all available sugars of 0.24 g/g and 0.27 g/g were obtained for batch and fed-batch mode of operation, respectively. The higher yield in the fed-batch process coincided with a higher degree of conversion of the sugars in the liquid medium, in particular of arabinose, for which the conversion was doubled (from 48% to 97%). Paja Brava, a Gramineae material, is the most common native grass species on the Bolivian Altiplano and is also widely distributed in South America in general . In this straw, D-xylose is the most predominant hemicellulosic sugar, constituting up to 25% of the total dry weight, which is similar to straw materials such as wheat straw or sugarcane bagasse [2,3]. Production of ethanol from lignocellulose requires cost-effective and environmentally sustainable processes . Principal options for ethanol production from lignocellulosics by the biological route include enzymatic hydrolysis followed by fermentation— Separate Hydrolysis and Fermentation, SHF—or Simultaneous Saccharification and Fermentation, SSF. The latter may include conversion of both conversion of C5 and C6 sugars, in which case the term simultaneous saccharification and co-fermentation, SSCF, is used . Significant advances have been made on the bioconversion of D-xylose into ethanol by genetic engineering of the yeast Saccharomyces cerevisiae to convert also xylose (e.g. ), which has been successfully applied for the conversion of Paja Brava in SSF . Other options include fermentation by engineered Escherichia coli  or Zymomonas mobilis . There are also naturally pentose fermenting yeasts, most notably Pichia stipitis and Candida shehatae, which offer a direct route  albeit requiring microaerobic conditions . P. stipitis is likely the most interesting of the natural xylose fermenting yeasts, since it is able to ferment a wider range of sugars and produces relatively little xylitol . In previous studies hydrolyzate fermentation by P. stipitis, inhibition effects by acid-hydrolysis derived products, e.g. furans, aliphatic acids and phenolic derivatives, were observed. The fermentation processes could be improved by a partial or a complete removal of these toxic compounds (detoxification), or through the adaptation of yeast by preculturing on hydrolysate as medium . Fed-batch SSCF is another attractive process option. With this approach, slurry is gradually fed into the reactor which provides a chance for adaptation as well as in-situ detoxification, i.e. a bioconversion of primarily inhibiting aldehyde compounds . An additional advantage of the fed-batch process is that higher solids loading can be applied than in batch mode, since the mixing problems due to a too high viscosity can be reduced . A high solids loading will contribute to the reduction of water use for ethanol production and improve the process economy . The objective of the present study was to assess the potential of the natural xylose-fermenting yeast P. stipitis (CBS6054) to ferment pretreated Paja Brava using the process concept simultaneous saccharification and cofermentation (SSCF). In addition, batch and fed-batch operation in the SSCF were compared. The Paja Brava (the brave straw) used in this study was obtained from the Bolivian Altiplano, (17˚S Latitude, 67˚W Longitude). The whole plant above ground was used. Dry material was prepared and analyzed in the same way as described previously . Its composition on an original dry weight (DW) straw basis was glucan, 34.4%; xylan, 25.2%; arabinan, 3.0%; galactan, 0.8%; Klason lignin, 21.2%; acid soluble lignin, 3.5%; acetyl, 1.2%; extractives, 2.4%; and ash, 6.1%. Several batches (300 g DW, 64% moisture content) of Paja Brava were pretreated at 200˚C for 5 min using 2.5% SO2 (percentage DW basis) in a pretreatment unit as described by Palmqvist et al. . These conditions have previously been determined to be optimal for steam pretreatment of Paja Brava, as described elsewhere . The pretreated straw was collected and subsequently separated in two fractions (pulp and hydrolysate). The xylose-fermenting yeast Pichia stipitis CBS6054 obtained from Centraalbureauvoor Schimmelcultures, Delft, The Netherlands was used throughout the work. The culture was routinely maintained on agar plates made from yeast extract 10 g/L (Merck, Darmstadt, Germany), peptone from soy 20 g/L (Merck, Darmstadt, Germany), agar agar 20 g/L (Merck, Darmstadt, Germany) and D-glucose 20 g/L (Sigma, Germany) as additional carbon resource. Culture media (200 mL) were prepared by adding mineral and salt solutions at the concentrations reported by Taherzadeh et al. with the exception of the D-glucose concentration (Sigma, Germany), which in the current study was 16.5 g/L. Synthetic medium and glucose were adjusted to pH 5.5 (NaOH 2.0 M) and autoclaved separately for 20 min at 121˚C. After cooling to about 25˚C, vitamin solution was added under aseptic conditions. The precultures were aerobically conducted in cotton-plugged unbaffled conical flasks (500 mL) using a thermostatic bath shaker (GYROMAX TM 929, Amerex instruments, Inc., Lafayette, CA, USA) at 160 rpm and 30˚C for 24 h. In the fermentation of hemicellulose hydrolyzates, culture broth from the E-flasks was centrifuged in 50 mL centrifuge tubes at 1800 × g for 10 minutes. Thereafter, the cell pellet was washed with sterile sodium chloride, 0.9% (w/v), and added in each hydrolysate medium flask to reach the desired cell concentration, which in the current study was 5 g/L DW. Cell growth was measured off-line by the optical density at 610 nm. SSCF experiments were preceded by a twophase yeast cultivation (batch and fed-batch) to produce the yeast needed according to Rudolf et al. . First, a batch cultivation of P. stipitis was made in a 2.5 L reactor (Biostat A plus Sartorious BBI systems, Melsungen, Germany) with a defined growth medium containing (per liter of solution): D-glucose, 21 g; (NH4)2SO4, 26 g; KH2PO4, 12 g; MgSO4×7H2O, 0.75 g; trace metal solution, 10 mL; and vitamin solution, 1 mL; the composition of the last two solutions as specified in Taherzadeh et al. . The batch cultivation was started by injection of 25 mL of inoculum. A total working volume of 0.7 L, including inoculum and medium, was used. The batch cultivations were made at a stirrer rate of 900 rpm, a temperature of 30˚C, a pH of 5.0 (controlled by automatic addition of 3.0 M NaOH), and using an aeration rate of 1.0 L/min (controlled by a mass-flow meter Bronckhorst Hi-Tech, Ruurlo, The Netherlands). The fed-batch cultivation started after depletion of the ethanol produced in the batch cultivation. A pentose-rich hydrolysate (Table 1), obtained from the steam pretreatment was used. The medium was supplemented with 35 g/L of D-glucose. The total substrate volume was 1.1 L. The initial feed rate was 0.04 L/h and this was linearly increased to 0.10 L/h in 16 h. The fed-batch conditions were the same as those in the batch cultivation with the exception of the aeration rate which was increased to 1.4 L/min. The yeast produced was harvested aseptically by centrifugation (3000 × g for 7 min) at 4˚C, washed and then resuspended in approximately 250 mL NaCl (0.9%) to give a cell concentration of 5 g/L in SSF experiments. Chemicals were obtained from Sigma-Aldrich Co, Riedel-de Haën, and Merck. Table 1. Composition of hemicellulose hydrolysate and cellulose fibre fraction from Paja Brava. with cotton stoppers through which a syringe for sample withdrawal were used for the semi-aerobic fermentations at 220 rpm at 30˚C in an orbital shaker (Forma scientific Inc., Marietta, USA). In anaerobic experiments, a sterile 300 mL flask (working volume 105.6 mL), equipped with a loop-trap according to Carrasco et al. , was placed in a rotary shaker (GYROMAX TM 929, Amerex instruments, Inc., Lafayette, CA, USA) at 170 rpm at 30˚C. The fermentation broth contained the following: 90.0 mL of hydrolysate; 11.6 mL of nutrient solution and 4.0 mL of inoculum. Nutrient solution, mineral salts and trace elements, were prepared according to Taherzadeh et al. . The composition of the hemicellulose hydrolysate of Paja Brava is shown in Table 1. A control anaerobic fermentation, simulating the Paja Brava hemicellulose hydrolysate, was also performed. The synthetic medium contained (g/L), D-xylose, 40.3 (Merck, Darmstadt, Germany); D-glucose, 3.9 (Sigma, Germany); L-arabinose, 6.2 (Sigma, Germany); and the same supplementation of nutrients as described previously. All liquid media were pH-adjusted to 5.5 with NaOH (2.0 M). The hemicellulose-fraction experiments were started by inoculation of yeast (to reach 5 g DW /L). Aliquots of 1 mL were withdrawn periodically to determine cell mass and stored at −18˚C for later HPLC analyses. Samples of micro-aerobic and anaerobic fermentations were taken after 0, 2, 8, 20, 44, 68 and 92 and 0, 2, 4, 6, 8, 24, 48, 72 and 96 h, respectively. All experiments were carried out in duplicates. Batch and fed-batch SSCF experiments, with a waterinsoluble solids (WIS) content of pretreated Paja Brava slurry of 10% were carried out in 2.5 L lab-scale bioreactors Biostat A, (B. Braun Biotech International), and Biostat A plus Sartorious BBI systems (Melsungen, Germany). The WIS content was determined according to Posey et al. . A working weight of 1.4 kg (approx 1.4 L) was used. The preparation of slurry by addition of nutrients, enzymes and yeast, for both batch and fedbatch mode, was made according to Carrasco et al. . In the fed-batch experiments, a total of six portions of slurry were added every second hour to reach the intended final WIS content. The SSCF fermentations were performed at a stirrer rate of 500 rpm a temperature of 35˚C and a pH-value of 6.0 (controlled by automatic addition of 0.3 M NH3). The temperature and pH were selected according to Rudolf et al. . Two aeration rates, 20 and 40 mL/min (controlled by a mass-flow meter Bronckhorst Hi-Tech, Ruurlo, The Netherlands) were tested. Samples for metabolite analyses were taken after 0, 2, 4, 6, 8, 24, 28, 32, 48, 72 and 96 h, and were immediately centrifuged and stored at −18˚C until analyzed. All experiments were carried out in duplicates. 1) Biomass Dry weight was determined turbidometrically at 610 nm (OD610) after the samples were diluted 1:10 in MilliQ-water to obtain absorbance values less than 0.5 in the spectrophotometer (SECOMAN CE, France). Cell dry weight was also determined by duplicate 10 mL samples, which were centrifuged at 1000 × g for 3 min. The supernatants were discarded and cell pellets were washed three times with distilled water and dried for 24 h at 105˚C and subsequently weighed. 2) Metabolite Analysis Prior to analysis by HPLC (Waters 1515, Milford, MA, USA), oligomeric and monomeric sugars and by-products (as furans and aliphatic acids) obtained as watersoluble solids (WSS) were analyzed according to the NREL procedure described in Sluiter et al. . All hydrolysate samples were centrifuged at 16000 × g for 5 min and filtered through 0.20 mm sterile filters. The pretreated pulp composition of Paja Brava was analyzed according to the NREL standard assay . 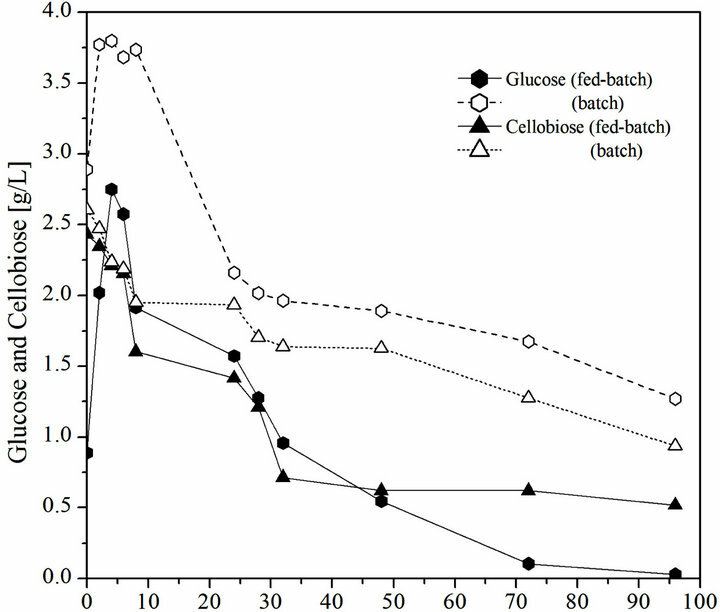 Cellobiose, glucose, galactose, xylose and arabinose, from liquid and solid fractions, were analyzed on an Aminex HPX-87P column (Bio-Rad laboratories, Hercules, CA, USA) at 85˚C. MilliQ-water was used as eluent at a flow rate of 0.6 mL/min. Ethanol, xylitol, glycerol, acetic acid, levulinic acid, formic acid, 5-hydroxymethyl furfural (HMF) and furfural were determined using an Aminex HPX-87H column (Bio-Rad laboratories, Hercules, CA, USA) at 60˚C with 0.6 mL/min eluent of 5 mM H2SO4. All metabolites were quantified using a refractive index detector (Waters 2410, Waters, Milford, MA, USA) with the exception of acetic acid, HMF and furfural, which were quantified using an ultraviolet (UV) dual absorbance detector Waters 2487 (Milford, MA, USA) at 210 nm. Yield calculations (g∙g−1) were based on the total sugar content, hexoses and pentoses, in the pretreated straw and the pretreatment liquid. The amount of ethanol produced in the SSCF was divided by the available amounts of glucose, xylose, and arabinose—including oligomers present in the slurry at the beginning of the experiment. During pretreatment a number of inhibitors can potentially be formed, most of which are found in the liquid fraction. For this reason, the fermentability of the nondetoxified liquid fraction from the pretreatment (i.e. the hemicellulose hydrolysates) of Paja Brava was first evaluated using the xylose-fermenting yeast P. stipitis CBS6054. It is well-know that microaerobic conditions improve xylose uptake by P. stipitis . For this reason both anaerobic experiments and semi-aerobic experiments were made in the initial evaluation of inhibiting properties. In previous studies, SO2-steam pretreatment has resulted in a relatively high concentration of hemicellulose sugars in the liquid fraction for different feedstock [3,23]. Xylose was found to be the completely dominant sugar in the liquid fraction after steam pretreatment (about 40 g/L), followed by arabinose (about 6 g/L), whereas only relatively low amounts of glucose and cellobiose were found in the liquid fraction (cf. Table 1). This agrees well with the fact that mainly the hemicellulose fraction is hydrolyzed during the steam pretreatment. Other compounds found at significant levels included acetic acid, a few grams per liter—formed from deacetylation of hemicellulose—as well as some furfural— formed as breakdown product of pentoses. In the anaerobic fermentation tests, the extent of inhibition was tested by comparing to fermentation of a synthetic medium with the same sugar concentration as the hydrolysate. Furthermore, tests were made in the semi-aerobic fermentations in which additional glucose was added, to investigate potential beneficial effects of presence of glucose. The simultaneous fermentation of (low amounts of) glucose has previously been shown beneficial for xylose fermentation in engineered xylose-fermenting S. cerevisiae strains . 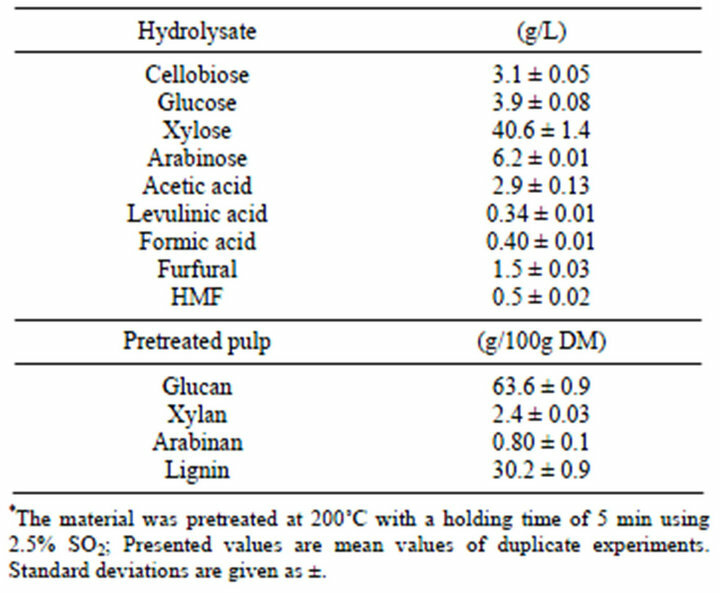 The conversion of the hydrolysate sugars when fermenting the pretreatment liquid alone was low under both anaerobic and semiaerobic conditions (Table 2). Only a minor fraction (<10%) of the sugars were converted anaerobically in the pretreatment liquid, in contrast to the case of a synthetic medium containing the same amount of sugars, in which all the glucose and half the xylose was consumed although at a low rate. The low rate of anaerobic conversion agrees with previous studies [11,25]. The difference between the synthetic medium and the pretreatment liquid indicate inhibitory effects on the P. stipitis fermentation. However, under semi-aerobic conditions, it was possible to obtain a reasonable conversion of glucose, especially for the case when glucose (20 g/L) was added to the medium. An ethanol yield of 0.13 g/g was obtained in this case showing that the inhibition per se was not complete, but rather that the xylose conversion was very low. Glucose was the preferred carbon source and was completely assimilated before xylose uptake started. In SSF, the glucose is gradually released to the medium through enzymatic hydrolysis of the cellulose fraction, in contrast to the experiments made with glucose addition to the pretreatment liquid described above. One may therefore expect further benefits from the SSF than the simple addition experiments, since glucose is released during a longer time period. The oxygen transfer rate (OTR) is a critical environmental factor in xylose fermentation by P. stipitis . In this study, an oxygenation rate of 8 mmol oxygen/L.h was used, which is the same oxygenation rate as was used by Rudolf et al. in their study on conversion of sugarcane bagasse. Increase of the aeration up to 16 mmol oxygen/L×h was also tested, but in that aeration rate was shown to be too high and virtually no ethanol was formed. Table 2. Sugar conversions and yields obtained in shake flask fermentations of hemicellulose hydrolysates by P. stipitis. Table 3. Measured final concentrations of ethanol, sugar consumptions and by-products as well as calculated yields in simultaneous saccharification and co-fermentation experiments using the xylose-fermenting yeast P. stipitis CBS6054. from Paja using P. stipitis compare well with yields obtained from sugar cane bagasse, it is clearly lower that what has been reported from Paja Brava using a genetically engineered S. cerevisiae strain, for which an ethanol yield close to 0.4 g/g was obtained . Further improvements in the ethanol yield in the case of P. stipitis may be possible by further optimization of the aeration. However, this is not trivial since the rates change over time as a function of hydrolysis rate and cell concentration. The fed-batch mode of SSF operation gave a somewhat higher overall ethanol yield than the batch case (Table 3). This is explained by the higher conversion of xylose, arabinose and cellobiose. In the batch SSF (Figure 1), the glucose concentration increased for the first 10 hours, reaching 3 g/L, whereas in the fed-batch case, the glucose concentration stayed below 3 g/L and the concentration peaked at 6 h. The initial increase in glucose concentration is caused by a higher initial rate of enzymatic hydrolysis than the rate of glucose consumption. As the hydrolysis proceeds, the rate of hydrolysis falls, resulting in a net decrease of glucose concentration. The glucose concentration in the fed-batch case stayed below that of the batch case throughout the process. Similarly, the xylose concentration decreased more rapidly in the fed-batch case than in the batch case. The yeast P. stipitis is able to transport both glucose and xylose (via lowaffinity system) by proton gradient-linked transporters [26,27]. The conversion of C5 sugars to ethanol was significantly improved by SSCF in comparison to the shake flask fermentations. Most likely this is connected to the co-utilization of glucose and the fact that the glucose concentration was lower than in the shake flask studies. According to Panchal et al. the glucose should be well below 2% (w/v)), before significant xylose uptake is initiated in the slurry substrate. Also for some Candida species (C. shehatae and C. stearolytica), utilization of xylose requires that the glucose stays below 3% - 5% (w/v) in the medium [28,29]. The xylose conversion was high already in the batch case, and even higher in the fed-batch case (Table 3). This may be connected to the lower glucose concentration, and thereby a more favorable xylose to glucose ratio in the fed-batch case, similar to what has been found for engineered xylose fermenting S. cerevisiae . However, this is not the only factor. 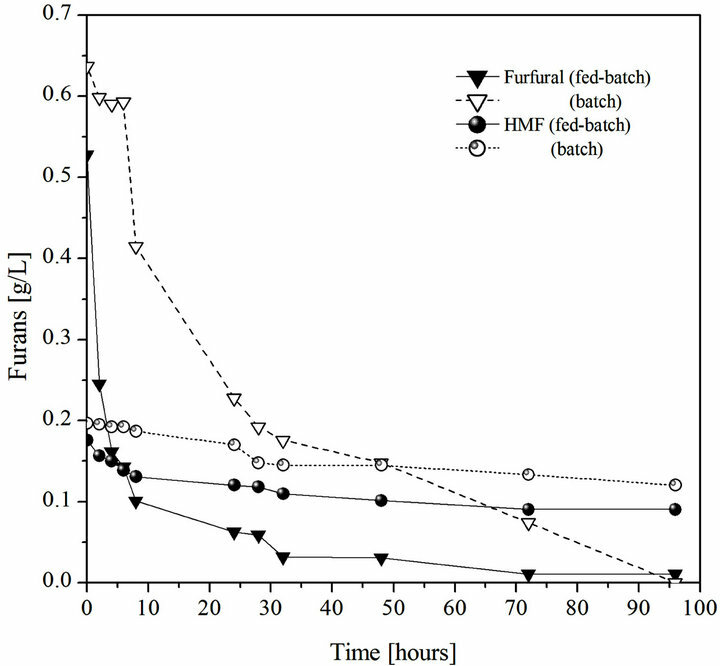 The conversion rate of the furaldehydes, furfural and HMF, were lower in the batch than in the fed-batch case (Figure 1). Since furfural is known to be reduced by the xylose reductase of P. stipitis , a competitive inhibition of xylose reductase by furfural could explain a lower xylose conversion rate in the batch case. The furaldehydes may also affect the enzymatic hydrolysis of the fibers . Figure 1. Concentrations measured in simultaneous saccharification and co-fermentation (SSCF) of pretreated Paja Brava using P. stipitis CBS6054. Batch fermentations are shown by dashed lines and open symbols and fed-batch fermentation are shown by continuous lines and filled symbols. (a) Concentration of xylose (diamonds) and arabinose (squares); (b) Concentration of glucose (circles) and cellobiose (triangles); (c) Concentration of furfural (diamonds) and 5-hydroxymethyl furfural (HMF, triangles). Figure 2. Concentrations of ethanol (circles) and xylitol (squares) measured during batch (dashed line, open symbols) and fed-batch (continuous line, unfilled symbols) simultaneous saccharification and co-fermentation (SSCF) using P. stipitis CBS6054. version of cellobiose also increased in the fed-batch process, although to a lesser extent. The simultaneous assimilation of sugars suggest that the xylose-metabolizing enzymes, xylose reductase (XR) and xylitol dehydrogenase (XDH), were not repressed by cellobiose and arabinose, which is consistent with the report by Bicho et al. on induction of these enzymes in P. stipitis in mixed sugar solutions. The current study has shown that steam pretreated Paja Brava can be converted in a fed-batch SSF process up to 10% WIS with an ethanol yield of 0.27 g/g using the natural xylose-fermenting yeast P. stipitis. 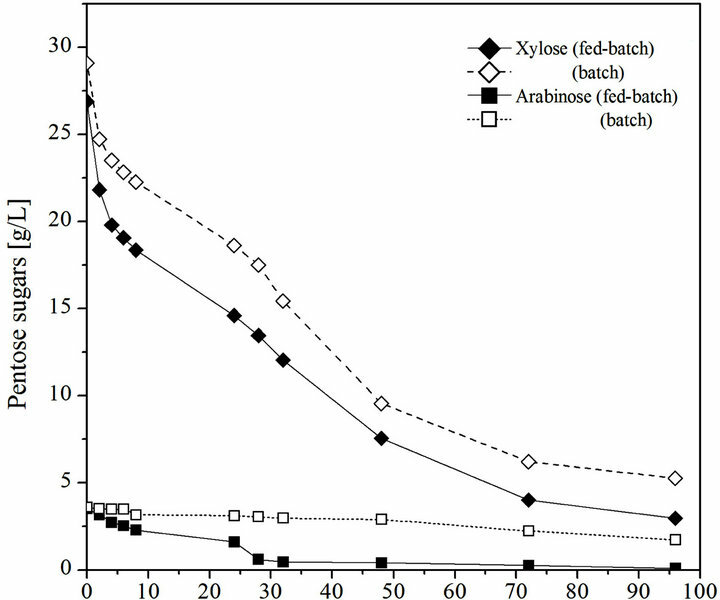 The conversion of xylose was strongly increased in comparison to fermentation of the xylose rich pretreatment liquid alone. Fed-batch operation in the SSF further increased the conversion of xylose, and arabinose. Further improvements— in particular with respect to aeration rates—are necessary to make the P. stipitis fermentation competitive with processes using recombinant S. cerevisiae. This work was funded by the Swedish International Development Cooperation Agency (SIDA). K. Skoog and B. Hahn-Hägerdal, “Effect of Oxygenation on Xylose Fermentation by Pichia stipitis,” Applied and Environmental Microbiology, Vol. 56, No. 11, 1990, pp. 3389-3394.